Burgundy’s famous annual charity wine auction at the Hospices de Beaune smashed its previous record with a total sale of 5.9 million euros. The auction, now in its 152th year, saw the average price of a bottle rocket by more than 54 per cent compared to last year to reach around 380 euros. This year’s record was reached despite a 30 per cent drop in the number of bottles on offer after a year that saw yields in Burgundy plummet due to terrible weather and disease. 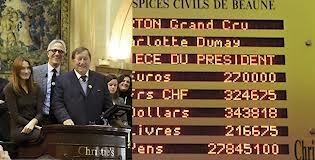 “This is above our predictions,” said Jean-David Camus of the Albert Bichot merchant house. The event, which is now run by British auctioneers Christie’s, attracts wine lovers from all over the world. Organisers said they had seen rocketing interest in the sale from Asian buyers. China is now Burgundy’s fourth largest export market behind Japan, Britain and the US.